In this chapter I’ll be exploring the implications of recent developments in ‘photogrammetry’, a digital capture technology that allows the reconstruction of geometrical models of the world from digital images, allowing the autonomous creation of ‘photorealistic’ 3D representations of objects and landscapes from a video or set of photographs. Through an examination of the design decisions and representational aesthetic of photogrammetry, and its typical use in scientific research, I’ll show how the practice of this technology introduces an unacknowledged interpretive framing, conforming to the dominant culture embodied in Western science. Dr Josh Harle is a multidisciplinary researcher and media artist with a background in computer science, philosophy, and fine arts. His practice explores the contemporary use of digital technologies to map and make sense of the world, critiquing the opaquely ideological practice of digital capture. He is the founder and director of Tactical Space Lab, an experimental VR studio, and a UNSW Art & Design Visiting Fellow. Harle, Josh. 2018. 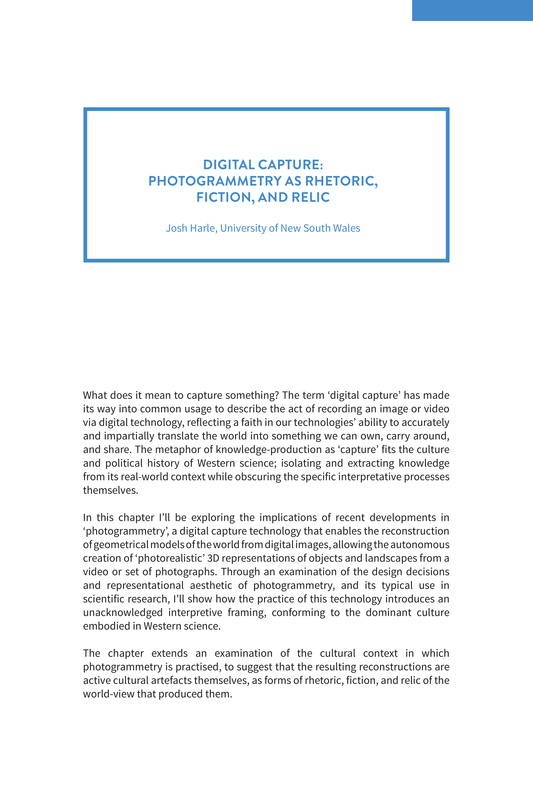 “Digital Capture: Photogrammetry As Rhetoric, Fiction, and Relic”. In Decolonising the Digital: Technology As Cultural Practice, 49-65. Sydney: Tactical Space Lab. http://ojs.decolonising.digital/index.php/decolonising_digital/article/view/DigitalCapture. By “open access” to this literature, we mean its free availability on the public internet, permitting any users to read, download, copy, distribute, print, search, or link to the full texts of these articles, crawl them for indexing, pass them as data to software, or use them for any other lawful purpose, without financial, legal, or technical barriers other than those inseparable from gaining access to the internet itself. The only constraint on reproduction and distribution, and the only role for copyright in this domain, should be to give authors control over the integrity of their work and the right to be properly acknowledged and cited.